For this configuration guide of News SEO, we'll act as if Yoast is a news agency and thus as if yoast.com is a blog with a lot of high-value news on technology. 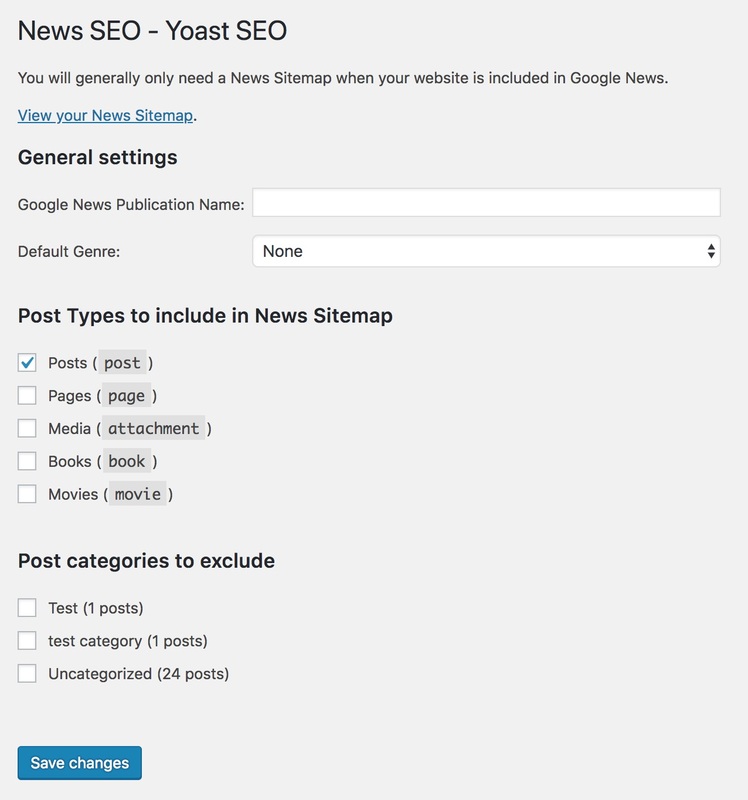 The News SEO plugin for the Yoast SEO plugin helps you do all the things that allow you to optimize your site for Google News. 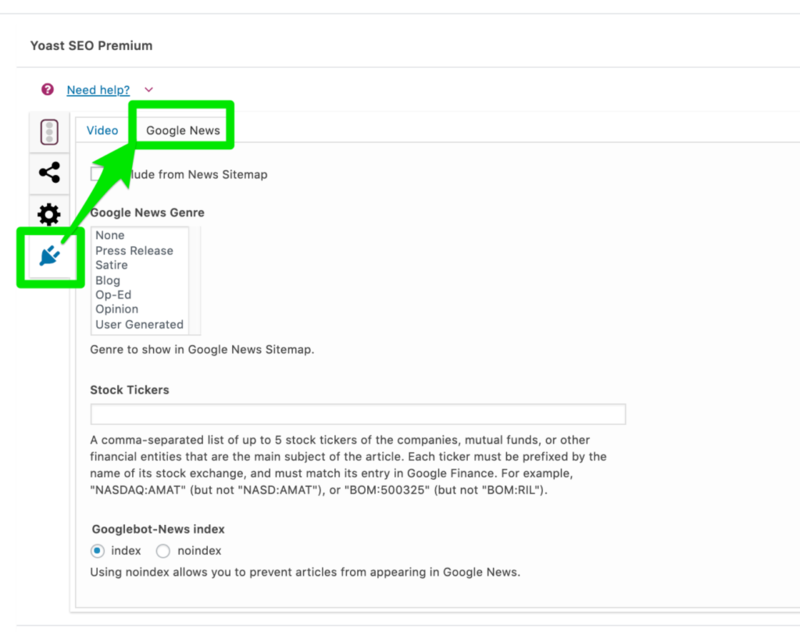 It creates XML News Sitemaps so Google can pick up on new articles as soon as possible, and helps you optimize some of the more advanced XML News sitemap options like stock tickers. To set up News SEO, go the admin of your website and click SEO -> News SEO. The 'SEO' settings will expand providing you additional options. Click on 'News SEO'. You'll see the following page. We'll go through this form step-by-step, trying to explain everything. This is the name that will be used when showing your news-items in Google News. Since our 'news agency' is named Yoast, that's exactly what we fill in here. This must match the name exactly as it appears in news.google.com. The default genre sets the default for the type of news you'll be offering to Google News. In our example we're writing posts on technology, so we set the genre to Blog. Google explains each genre here to help you select the appropriate one for your site. News SEO will list all post types you have on your website, so you can pick which ones should be included in the News Sitemap. You should only pick the Post Types that actually contain your news. In our example below, we'll only pick Posts, as all our relevant articles are of the posts. Our pages do not contain news-worthy information, just information about Yoast, like contact information. News SEO will list all the post tags and categories you have on your website. When you select a tag or category, any Post types that have that will not appear on the News Sitemap. This feature was removed in Yoast SEO: News 7.6 as the new version of Google News no longer supports this tag. Now it's time to save your changes. After saving, you'll see all the categories associated with the Post Types you selected. 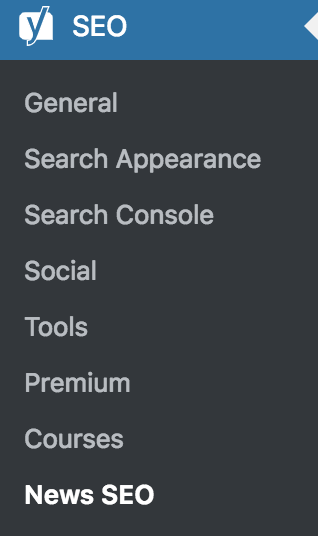 You can now choose which categories you want to EXCLUDE from the News Sitemap. Once you set up News SEO, you can start using it for your articles. After writing your article, scroll down to the Yoast SEO Metabox and click on the plugin icon on the side and then the Google News tab. You can choose per post if it should be excluded from the News Sitemap. Select the type of news you'll be offering to Google News. In our example we're writing blogposts on technology, so we set the genre to Blog. Stock tickers are (Google Finance) references to companies that are in a stock market. You should only add a stock ticker if you mention the company in the post and it plays a significant role. Each ticker must be prefixed by the name of its stock exchange, and must match its entry in Google Finance. You can add up to 5 stock tickers per post. You can do so by adding a stock ticker in the Stock Tickers box in the Google News Tab. Above you can exclude the article from your news sitemap but this does prevent Google from discovering the article from a normal crawl of your site. If you want Google to show the article in standard search results but not in the news section, please set this to 'noindex'. Learn more about this feature here. These features were removed in Yoast SEO: News 7.6 as the new version of Google News no longer supports these tags.